We still remember the midnight of Nov. 23, 1995, when Akihabara was filled with people waiting for the release of the Japanese Edition of Win 95. By the end of 1999 more than 200 million copies were sold all over the world, enabling easy computing for vast majority. Win95 was the sensation. Compared to this, Microsoft's latest "Windows 7" made rather a quiet start. But craziness of fans seems to be increasing. Fast food chain Burger King brought enormous "Windows 7 Whopper" which uses 7 meat patty per serving. How could we miss the chance? 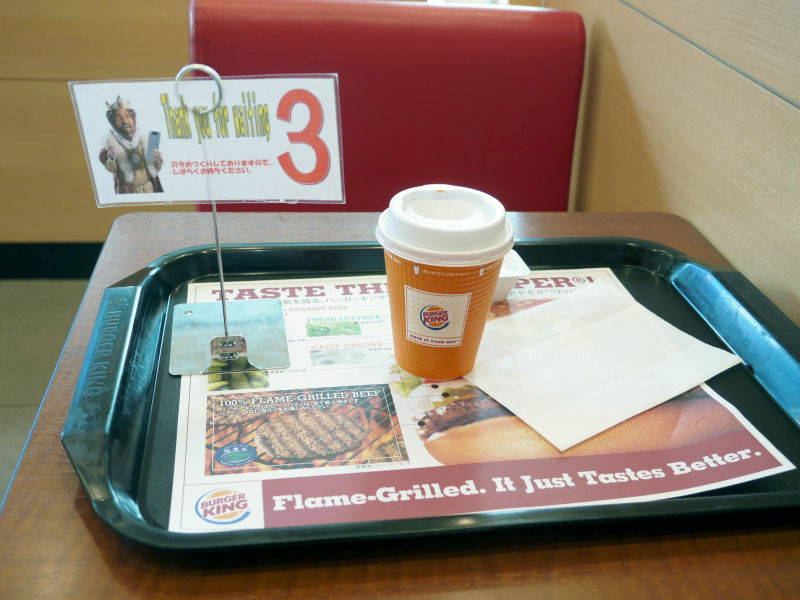 We dashed to the nearest Burger King and gave it a try. Burger King chain is rather a minor franchise here in Japan. We had to go 200 miles for a bite. Maybe we hustled a bit too much. 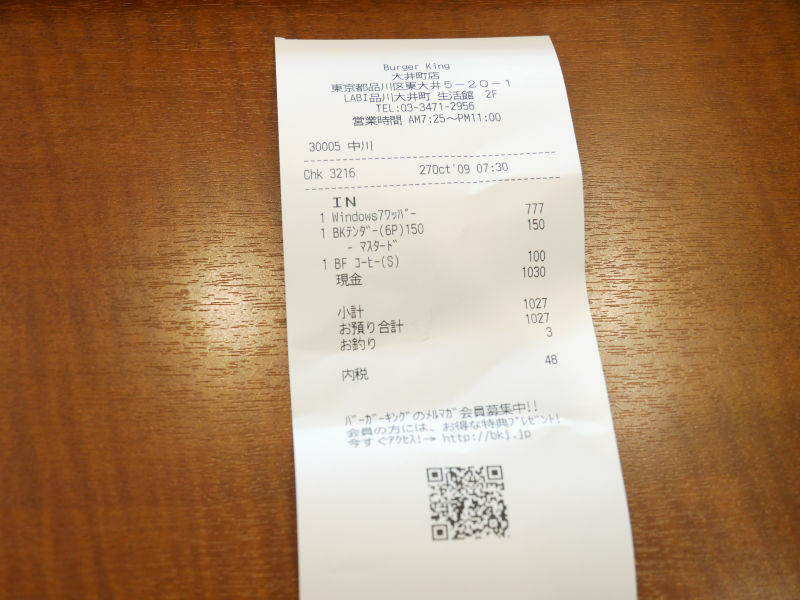 We arrived here before opening. There were already a queue. 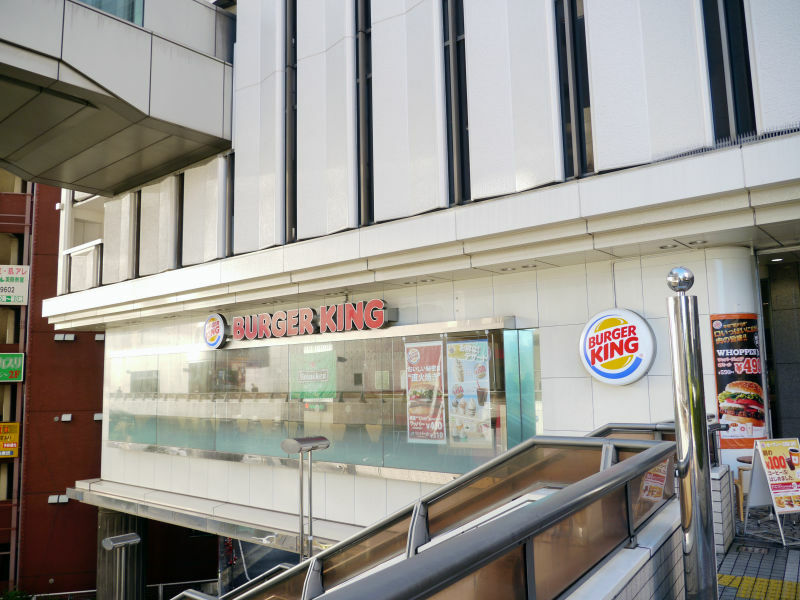 They do love Whopper. 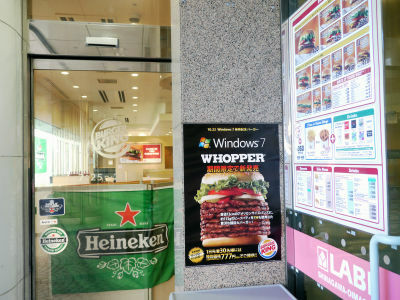 Windows 7 Whopper is priced at 777 JPY(about $8 USD)for limited period until Oct. 28. We had to wait for a while. Theoretically they need 7 times longer cooking time for it. ...and here comes "Windows 7 WHOPPER"
Labeled with Windows 7 sticker. There were limited number of stickers so you have to hurry if you want one. The problem was...its height. How could I bite this? 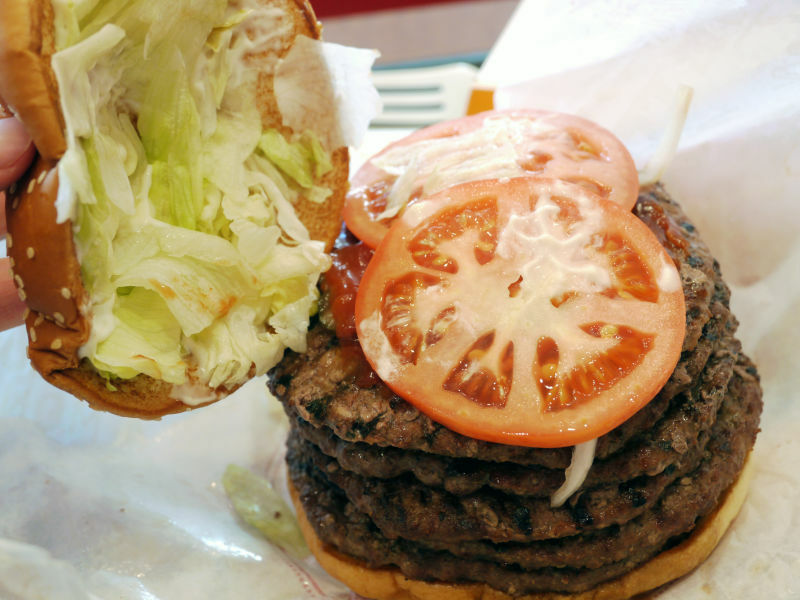 Disassembling; Two pieces of tomato, lettuce, onion pickles and 7 meat patties. Needs some contemplation to know where to start. It's too heavy and fragile to give it a grab. 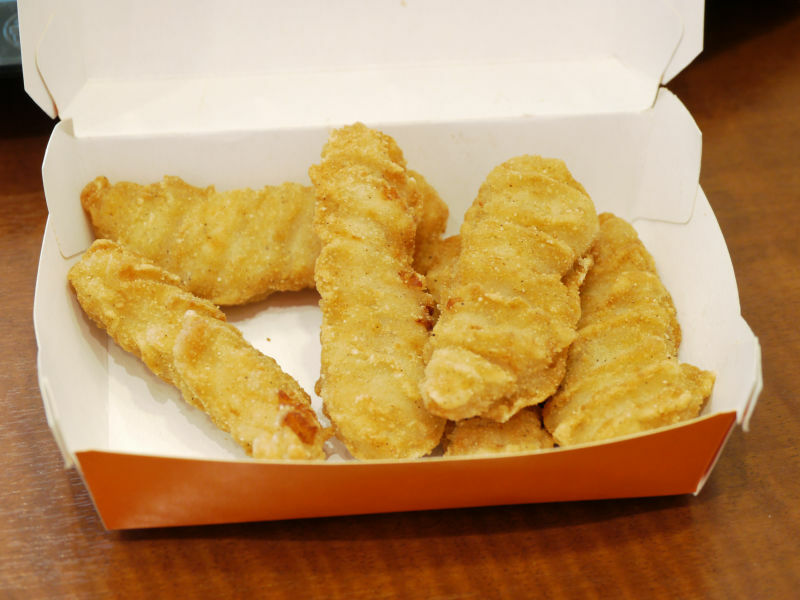 You could start with BK Tenders(chicken nuggets). 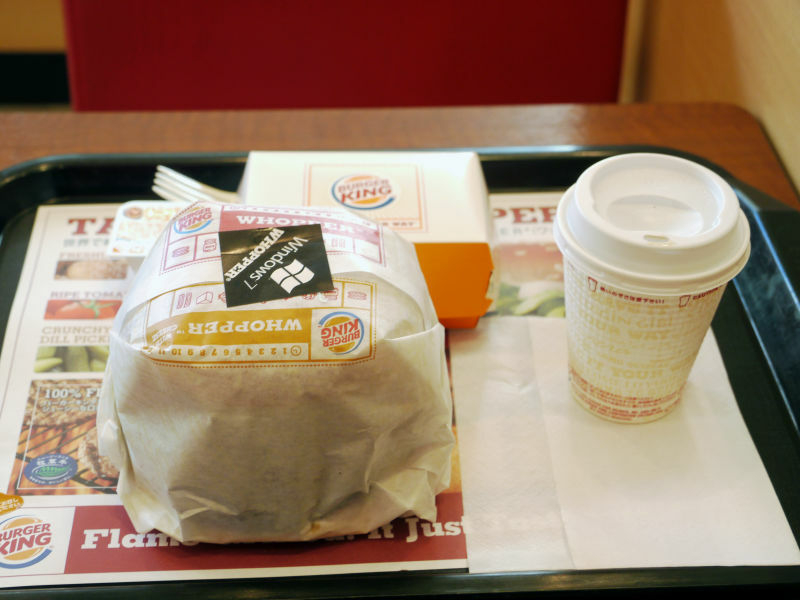 But you should consider whether you can beat the hamburger with these fried meats in your stomach. It's up to you. 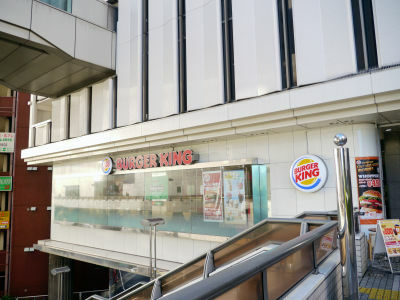 It tastes just like other hamburgers but there will be no man who can bite this through from the top to the bottom. The meat was so thick so our mouth became full of brewis but other toppings were concentrated at the top. 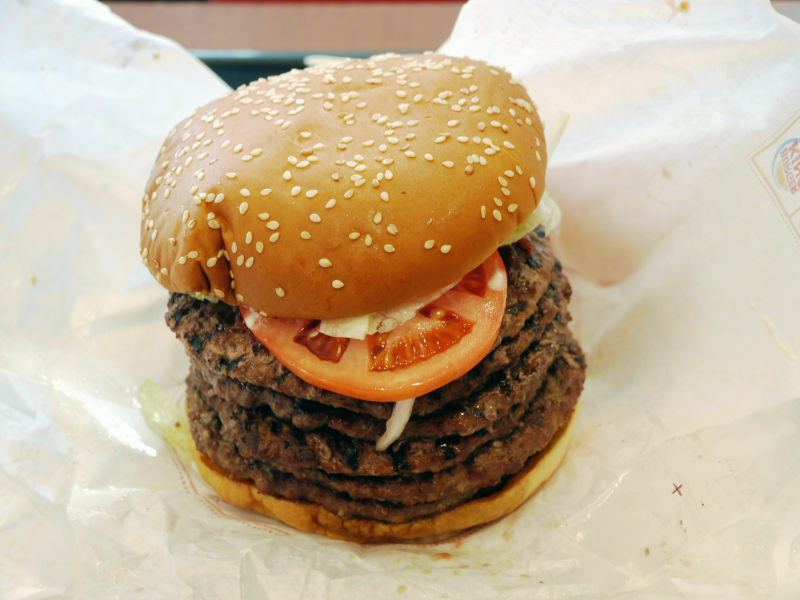 It's hard to call this thing a hamburger. You don't eat this, you just dig down this chunk of meat. A mustard sauce they gave us for chicken nuggets helped us a lot in beating this monstrous meat chunks. You could say it's quite clever to order various side menus for variety's sake. Otherwise you would be bored with this. It was 8 o'clock in the morning and this is too heavy for a breakfast. 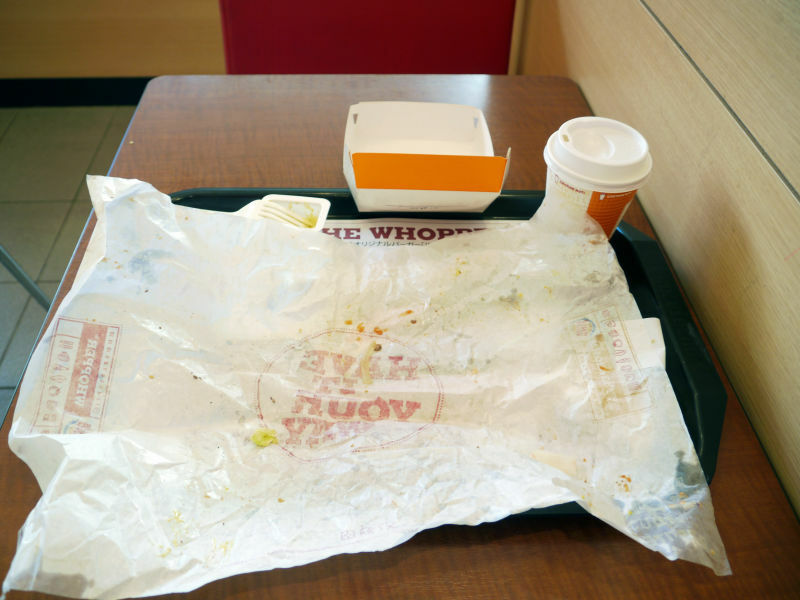 It's also too much for a quick lunch. 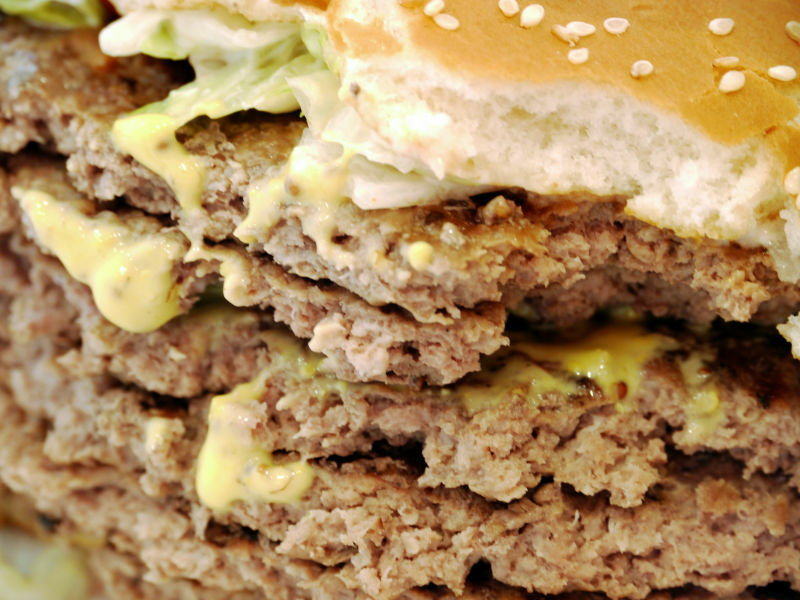 Hardly you can call this a fast food. It takes your time much. It took about an hour to complete this stuff. 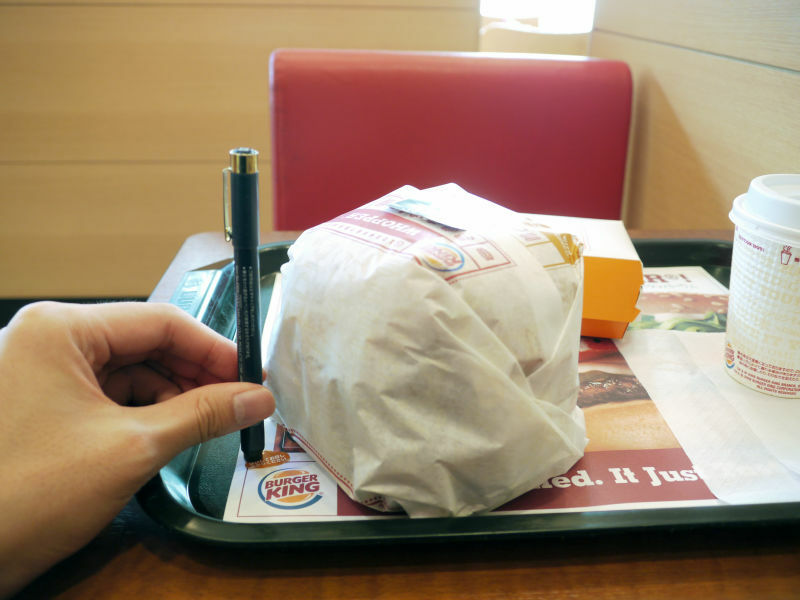 The best way to try this is coming to Burger King with two or more people for one Windows 7 Whopper. 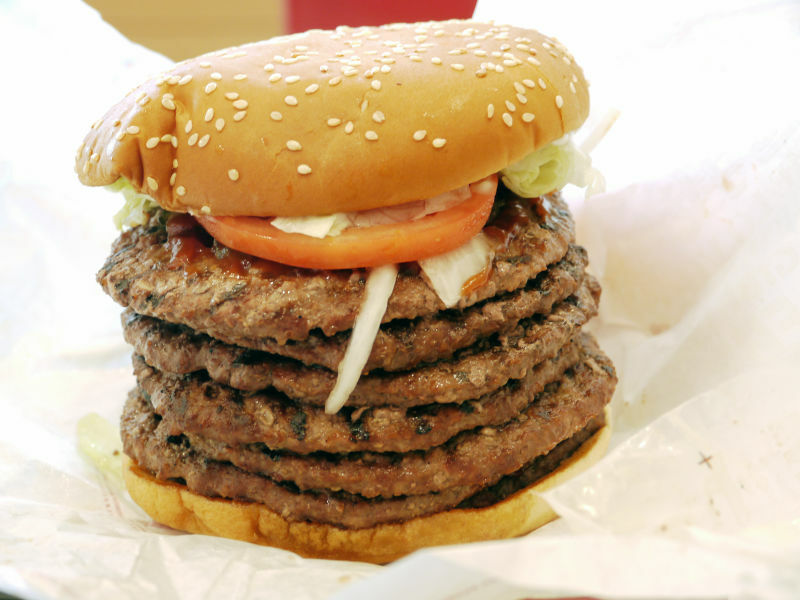 We won't recommend "one Whopper for each" style; It is like digging your own grave. 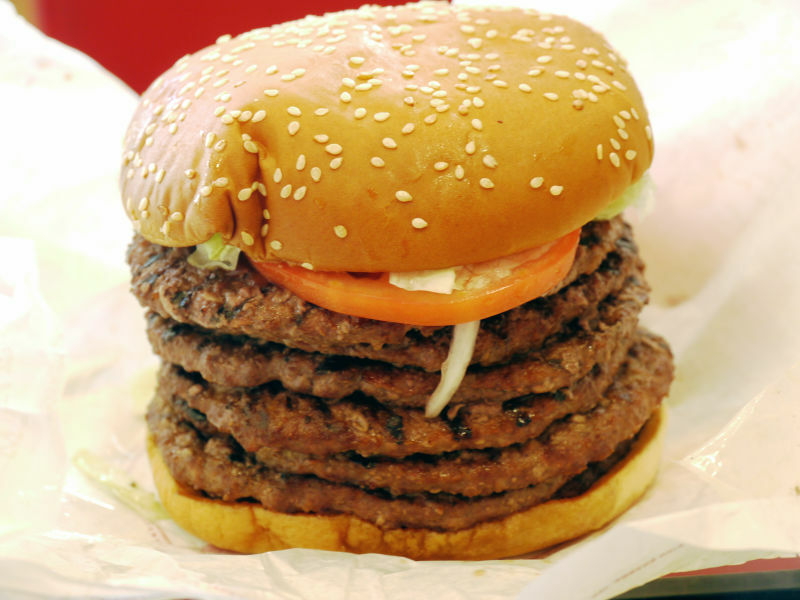 If you want a large amount of meat, maybe you can give it a try. 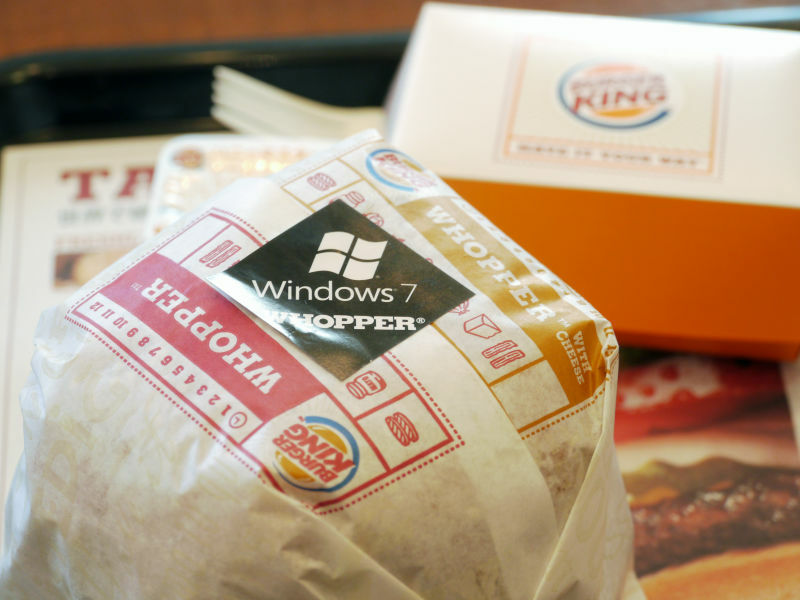 But in such case, we say that 7 ordinary Whoppers are far better than one Windows 7 Whopper.